Richard Neil Zare (born November 19, 1939) is a Professor of Chemistry at Stanford University. His professional specialty is physical chemistry. 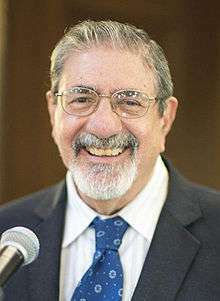 Throughout his career, Zare has made a considerable impact on the field of physical chemistry. He has mentored over 150 PhD students and postdoctoral researchers. Zare earned his B.A. in 1961 and his Ph.D. in 1964 in physical and analytical chemistry at Harvard University under the direction of Dudley Herschbach. Zare is the author of various academic papers involving the research of the spectroscopy of chemical compounds. Zare has been involved in astrobiology. He is co-author of a paper forwarding the hypothesis that a meteorite from Mars, ALH84001, contained traces of Martian life. Other researchers have questioned these findings and they remain controversial. Zare has been involved in public speaking in his home area of Silicon Valley and around the world. "Hadamard Transform Time-of-Flight Mass Spectrometry: More Signal, More of the Time," F. M. Fernández, J. R. Kimmel, and R. N. Zare, Angewandte Chemie, 42, 30-35 (2003). "Chemical Cytometry on a Picoliter-Scale Integrated Microfluidic Chip," H. Wu, A. R. Wheeler and R. N. Zare, Proc. Natl. Acad. Sci. USA, 101, 12809-12813 (2004). "Laser Control of Chemical Reactions," R. N. Zare, Science, 279, 1875-1879 (1998). "Anatomy of Elementary Chemical Reactions," A. J. Alexander and R. N. Zare, J. Chem. Ed., 75, 1105-1118 (1998). "Observation and Interpretation of a Time-Delayed Mechanism in the Hydrogen Exchange Reaction," S. C. Althorpe, F. Fernández-Alonso, B. D. Bean, J. D. Ayers, A. E. Pomerantz, R. N. Zare, and E. Wrede, Nature, 416, 67-70 (2002). 2011 - King Faisal International Prize. 2012 - Recipient of the Reed M. Izatt and James J. Christensen Lectureship. ↑ McKay, D. S.; Gibson, E. K.; ThomasKeprta, K. L.; Vali, H.; Romanek, C. S.; Clemett, S. J.; Chillier, X. D. F.; Maechling, C. R.; Zare, R. N.; et al. (1996). "Search for past life on Mars: Possible relic biogenic activity in Martian meteorite ALH84001". Science. 273 (5277): 924–930. Bibcode:1996Sci...273..924M. doi:10.1126/science.273.5277.924. PMID 8688069.